The Bomorian scinos is a reclusive inhabitant of mile-deep caves that riddle the jungles and rainforests there. No daylight can reach this deep into the planet, so the scinos has learned to navigate without eyesight. 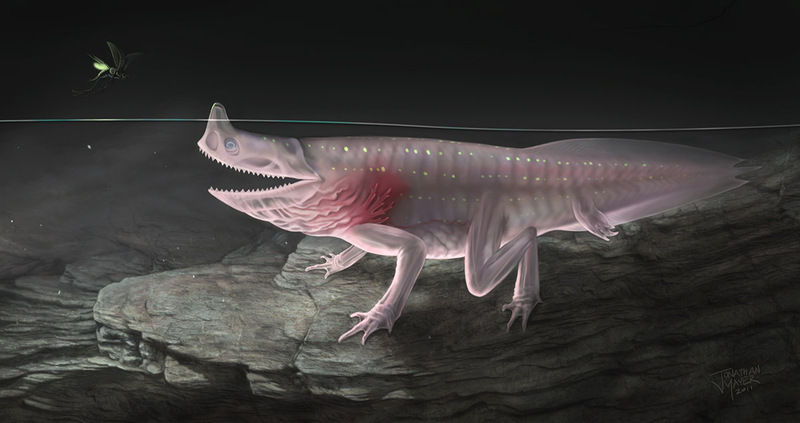 It is an amphibious fish-like creature with six limbs, sharp triangular teeth, and translucent skin. The average adult weighs 3 kg., or about 6.6 lbs. It inhabits the ice-cold subterranean lakes and the rocky areas surrounding them. Its diet is mostly carnivorous, but it can survive on plankton for short intervals of time. The scinos cannot see, so it uses its senses of touch, sound, and smell to locate prey. The bioluminescent markers on its body help to attract its favorite meal, the Bomor lantern beetle. Lantern beetles create their own light and are drawn to other lights. The scinos waits under the surface of the water, with its snorkel-like sensor protruding above. When the beetle is close enough, the scinos will jump out of the water and snap it up. The male and female scinos are nearly indistinguishable, except for the strong odor that females produce in order to attract mates. A female scinos lays 8-10 eggs in a nest just at the edge of the water. She remains with them until they hatch into their larval form.